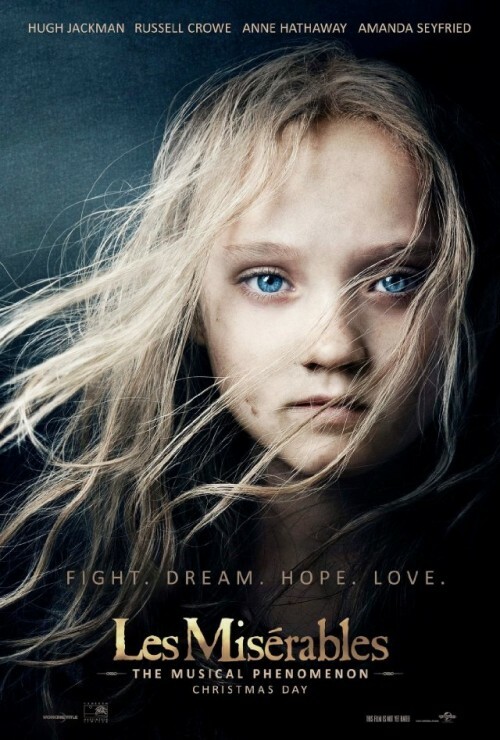 Les Misérables – the title says it all … unfortunately. This Victor Hugo story has been brought to the screen many times already, with varying degrees of success. I was brought up on it, watching every year of elementary school for French class. It was a TV version starring Richard Jordan as Valjean and Anthony Perkins as Javert. I’ve read the novel. And I’ve seen the Broadway show numerous times with numerous companies, in numerous cities. I know the libretto backwards and forwards. Needless to say, I’ve been looking forward to this. And I’m quite disappointed for quite a number of reasons. I can see what director Tom Hooper trying to do. Retain the grittiness of the story. Its dark. There’s lots of despair. But, in the process, Hooper made some grievous errors with some of his decisions. The first was in the casting, and then what to do with the cast. The decision was made to cast actors that could sing (kind of), rather than casting singers who could act. Les Miserables is equivalent to an opera — although some cultural diehards would probably hang me for making the connection. Like The Phantom of the Opera or Evita, the entire performance is sung. And the music isn’t written for typical voices. Valjean is a tenor who hits the very ceiling of the tenor range. Javert is a baritone who hits the basement. These leads also hit sustained notes that would make normal vocal cords strain to pain. Hugh Jackman has been on stage in singing roles before including Curly in Oklahoma! and The Boy From Oz. However, he is not up to Valjean’s power. And you can hear him straining. I’m not even going to go into the unfortunate choice of Russell Crowe as Javert. Jackman is Pavarotti compared to this mess. Crowe is a good name for his singing style. Its harsh, untrained, unrefined, nasal, and stilted — all which take away from the gravity of Javert’s character. One absolute standout is Anne Hathaway as Fantine. She has the pipes as well as the acting chops to bring out the travesty that is Fantine and her plight. What is more tragic is the limited amount of screen time she holds. Her character is pivotal to the story, but alas we lose her early (SPOILER ALERT!). But it was the best place for her. She’s too old for Eponine, and both too old and the wrong vocal range for Cosette. Helena Bonham Carter and Sacha Baron Cohen as the Thenardiers were adequate (Helena moreso than Sacha. Helena exercised her vocals as Mrs. Lovett in Sweeney Todd, while Sacha’s experience is King Julian in Madagascar singing “I Like To Move It Move It”. Let’s hope he’s lip-syncing as he plays Freddie Mercury). But their roles don’t demand the vocal power of the leads. Plus, they are comedic characters and they have a lot more latitude. Although as a side note, I don’t think that Hooper (or his editor) have the comedic sense or timing to bring out the potential laughs in pieces like “Master of the House”. Samantha Barks is the only one who migrated from the stage cast in the role of Eponine and truly brings it, especially with “On My Own”. Amanda Seyfriend is surprising as the soprano Cosette whose vibrato could be reigned back a bit. And Eddie Redmayne, who was fantastic in My Week With Marilyn, doesn’t really live up to Marius. If you’ve heard Michael Ball in this role, he has a voice that make women (and men) swoon. Marius is love blind but still has the balls to stand with his fellow students on the barricade. Redmayne doesn’t find that strength through most of the show, but must have saved it for “Empty Chair, Empty Tables”. On top of casting mistakes, Hooper wanted to retain raw performances, so singing was recorded on set rather than a recording studio. Nor, supposedly, were the performances sweetened at all in post. And listening to it, I believe it. Now while I understand the concept, I don’t feel that the execution met its purpose. The music is the very foundation of the play, and hence the film. Not getting THAT right undermines the entire experience starting at the opening scene. The film suffers from other difficulties beyond the music, however. Throughout most of the film, Hooper’s King’s Speech cinematographer Danny Cohen throws on extremely short lenses and goes handheld. I THINK he’s attempting to generate a sense of immediacy. But it ends up being extremely distracting. The camera is constantly shifting and reframing, and frequently getting so close to the talent as to distort their faces to inappropriately comic effect. For “I Dreamed A Dream”, they could have locked off on Hathaway, and we would have been happy to watch her for five minutes. For “What Have I Done”, when Valjean decides to throw away his parole papers, the camera moves all over the place in a small chapel, with lens distortion bending the scene vertiginously. The whole result is a scene that is far too kinetic for the tone of the song. (Although, I did admire the camera pulling away over the chapel and cliff as his ripped papers fly into the wind. Nice touch.). This a consistent problem – the camerawork and style not matching the tone of the scene. This trend of poor camera choices permeates the film, and it is compounded by editing that feels like it would be more appropriate in Shaun of the Dead. Good movie. Not a musical drama. And guess what, the editor DID edit Shaun of the Dead… and Hot Fuzz, and has special thanks on Attack the Block and Scott Pilgrim vs. The World. So, what have we learned? Good editors for one kind of movie are horrible for another. Although, I can’t point to why the comedic parts in Les Miz just aren’t all that funny. At least for “I Dreamed A Dream” and Eponine’s “On My Own”, the editor, Chris Dickens, lets the performances stand on their own without cutting. He should have used the same approach on “Rain Will Make The Flowers Grow” But in all of the cases, Dickens fails to let the moment breathe at the end, and immediately cuts away. Grrr. This is a systemic editorial issue. There is never time to allow moments to live out their moment. For a stage performance, there are pauses at moments like this — mainly to allow for applause. But, regardless of the purpose, what it provides is time for the audience to take in the emotion of the scene. If we are immediately torn away, we are stripped of that opportunity to be touched by the passion, or excitement, or despair. ** Side note: Who directed a sole guy to walk through in the background through the rainy streets behind Eponine during “On My Own”? There IS some visual metaphor for the name of the song as well as the literal meaning in the lyrics. Come on, Tom. The combination of frenetic camerawork and more frenetic editing makes for a frequently confusing and often annoying film experience. And again, I say this only with the genre in mind. This style IS better for Attack the Block or maybe a Saw film. NOT for a grand, operatic story about the desperation of man, and enlightenment in the face of despair. There are a few story points that I have issue with. The most obvious is the removal of Valjean’s prisoner number tattoo’d on his arm. Its an indelible symbol of his past life despite throwing away his papers which comes back numerous times. First, to prove to the courts that he is Jean Valjean. And later, Thenardier pulls back Valjean’s sleeve as sees the number. Realizing he is a convict, Thenardier uses the information to his advantage by revealing the information to Javert to avoid his own arrest. It doesn’t seem like a difficult piece to have included. I can’t see a reason to have omitted. However, I do like a lot of additional exposition that wasn’t included in the stage version to fill in some story holes. Showing why Jean Valjean is as strong as he is (lifting the flag as the beginning), which later is a cue to Javert that Valjean (now Monsieur La Mayor) may not be who he claims. Another is showing Valjean’s escape after his face off with Javert after Fantine dies. In the stage version, Valjean simply runs offstage after shaking a chair menacingly at Javert. And also, showing that Javert is constantly on their tail once Valjean gets Cosette, as well as having the man Vanljean saved earlier be the one who helps to hide them. Now, with all that criticism, you would think that I hated the film. I did not. The story is always one that moves me. But I attribute that to Victor Hugo, and not to Tom Hooper. I still could get lost in it despite the flaws.